Preservation of skin integrity, reduction of the potential development of atopic dermatitis (eczema) and education of parents is a key nursing priority in the care of the term and preterm infant. The Stratum Corneum is the outermost layer of the epidermis which acts as mechanical barrier. It protects against toxins, irritants, allergens and pathogens, retains heat and water as well as maintaining a normal microbiome. Understanding the physiological and anatomical skin differences of preterm and term baby skin is important to the Neonatal Intensive Care Nurse aiding thorough assessment and appropriate management of the skin. This guideline is directed towards neonates (birth to 28 days of age) of all gestational ages. Please see Key differences in Infant Skin for further information on the structure and function of newborn skin. To maintain skin integrity and minimise heat loss in the infant requiring hospitialisation. This is achieved by understanding the key differences of preterm and term infant skin enabling the NICU nurse to appropriately assess and manage our neonatal population using evidence based practice. pH - A figure representing the acidity or alkalinity of a solution on a logarithmic scale where 7 is neutral, < 7 is more acidic and > 7 more alkaline. Assessment of infant skin should be undertaken daily, or more frequently as clinically indicated. Infants at increased risk of systemic infection and longer hospital stays will be identified promptly. The Neonatal Skin Condition Score (NSCS) may be used to measure skin condition objectively. The relevant medical team must be notified if an infant scores a single score of 3 in one area or a combined score of 6 and above. A dermatology referral may also be appropriate. The following guidelines apply to all neonates. Additional considerations for the preterm infant and product examples for use are identified in the boxes below each section. The perineal environment is prone to changes in the skin barrier causing skin irritation. Increased moisture, prolonged contact with irritants, and an alkaline skin surface may contribute to skin breakdown. Bathing should occur daily if possible. - Less than 32 weeks gestation: Gently cleanse with warm water and soft materials (cotton wool balls) when clinically appropriate. No cleansing products. Avoid rubbing. - More than 32 week’s gestation: pH neutral cleansers may be utilised. Infants may be bathed every 2-3 days. A number of measures can be undertaken to ensure a reduced incidence of skin trauma with the use of adhesives in NICU. Consider if ECG dots are truly necessary; the infant may be safely monitored using a saturation probe only. Current best practice exists for the taping of venous and arterial lines, however the following are general considerations. Tegaderm and Leukoplast tapes are to be avoided in infants less than 27 weeks (at minimum all leukoplast is to be ‘double backed’ or dabbed with cotton wool to reduce adherence to surface area. Very little data is available on what disinfectants are best suited to the infant skin, in particular preterm infant skin. If a disinfectant is required in infants less than 14 days of age and/or less than 30 weeks gestation, gently cleanse the skin with sterile water after the procedure. Chlorhexidine Gluconate aqueous solutions (0.1% Chlorhexidine Gluconate) are preferred in the preterm infant. The surrounding area should be cleansed thoroughly with a moistened gauze square after use. A number of studies have shown chemical burns in preterm infants where Povidone-Iodine and Isopropyl Alcohol were used, this should therefore be avoided. Emollients restore lipid levels, improve hydration, preserve natural moisturising factors and offer significant buffering capacity to normalise skin pH and maintain skin microbiome. A common condition affecting as many as half of all full term newborn infants. Most prominent on day 2, although onset can be as late as two weeks of age. Often begins on the face and spreads to affect the trunk and limbs. Palms and soles are not usually affected. 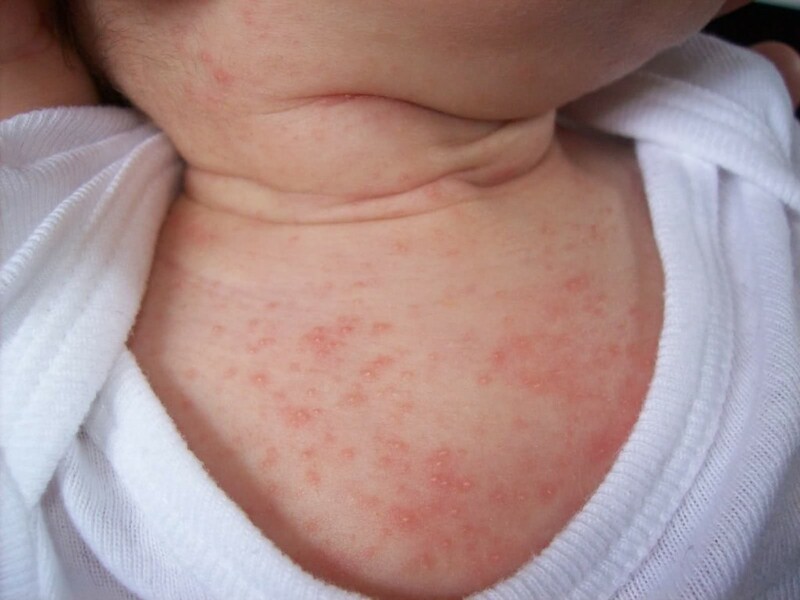 Clinical features: Erythema Toxicum is evident as various combinations of erythematous macules (flat red patches), papules (small bumps) and pustules. The eruption typically lasts for several days however it is unusual for an individual lesion to persist for more than a day. Treatment: The infant is otherwise well and requires no treatment. Figure 1. Erythema Toxicum Neonatorum. Affects 40-50% of newborn babies. Few to numerous lesions. Clinical features: Harmless cysts present as tiny pearly-white bumps just under the surface of the skin. Often seen on the nose, but may also arise inside the mouth on the mucosa (Epstein pearls) or palate (Bohn nodules) or more widely on scalp, face and upper trunk. Treatment: Lesions will heal spontaneously within a few weeks of birth. Arises from occlusion of the sweat ducts. In infants, lesions commonly appear on the neck, groins and armpits, but also on the face. Clinical features: 1-3mm papules (vesicular or papular). Treatment: Remove from heated humid environment or adjust incubator temperature. Cool bathing or apply cool compresses. Topical steroids may be used to facilitate relief while the condition resolves. Infantile acne or 'milk spots'. Affects babies within the first few weeks of life. Increased activity of the newborns' sebaceous glands cause inflammation and folliculitis. Clinical features: Erythematous dome shaped papules and superficial pustules arise in crops, commonly affecting the cheeks, nose and forehead. This rash is not itchy. Treatment: Will resolve within weeks without treatment or may be treated with ketoconazole shampoo (i.e. Sebizole shampoo) diluted 1:5 with water. Apply with a cotton bud twice a day. Rinse off with water after 10 minutes. Or apply Hydrozole cream bd to the affected areas until the rash has resolved. Evidence table for the Neonatal and Infant Skincare guideline can be viewed here. Allwood, M. (2011). Skin care guidelines for infant’s 23-30 week ‘gestation: a review of the literature. Neonatal, Paediatric and Child Health Nursing, 14(1), pp. 20-27. Association of Women’s Health, Obstetric and Neonatal Nurses (2013). Neonatal Skin Care (Third Edition) – Evidence Based Clinical Practice Guideline. Blackburn, S. (2007). Maternal, Fetal & Neonatal Physiology: A clinical perspective. Missouri: Saunders Elsevier. Clemison, J., & McGuire, W. (2016). Topical emollient for preventing infection in preterm infants (review). Cochrane Database of Systematic Reviews 2016, Issue 1. Art. No. : CD001150. DOI: 10.1002/14651858.CD001150.pub3. Gregory, J., Anschau, N., McCutchan, D., Patterson, J., Martin, S., & Allwood, M. (2011). Skincare Guidelines for babies in NICU. Kaleidoscope, The Children’s health network. Horimukai, K., Morita, K., Masami, N., & Mai, K., et al. (2014). Application of moisturizer to neonates prevents development of atopic dermatitis. Journal Allergy and Clinical Immunology, 134, pp. 824. Lund, C., Nonato, L., Kuller, J., Frank, L., Cullander, C., & Durand. (2010) Disruption of barrier function in neonatal skin associated with adhesive removal. Journal of Pediatrics, 131 (3), pp. 367 – 372. Simpson, E., Chalmers, J., Hanifin J., & Thomas, K., et al. (2014). Emollient enhancement of the skin barrier from birth offers effective atopic dermatitis prevention. Journal Allergy and Clinical Immunology, 134, pp. 818 - 823. The Royal Women’s Hospital (2016). Clinical Practice Guideline - Skin Care for Newborn Babies. Varda, K., & Behnke, R. (2000). The effect of timing of initial bath on newborn’s temperature. Journal of Obstetric, Gynecologic & Neonatal Nursing, 27 (32). The development of this nursing guideline was coordinated by Alanah Crowle, Clinical Support Nurse, Neonatal Intensive Care and Robyn Kennedy, Nurse Consultant, Dermatology, and approved by the Nursing Clinical Effectiveness Committee. Updated April 2017.